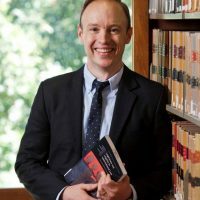 Sean Richmond is a Canadian lawyer and academic who researches, teaches and advises in the areas of international law and international relations. He joined the Department of Law and Legal Studies at Carleton University in July 2018, where he teaches Public International Law; the Criminal Justice System; and Law, State and Citizen. Prior to this position, Sean was the Special Advisor to Canada’s Legal Adviser at the Department of Foreign Affairs, and a Legal Officer in the United Nations, Human Rights and Humanitarian Law Section. He also taught at Carleton’s Norman Paterson School of International Affairs. Sean was an Assistant Professor (Tenure-Track) in the Law Faculty at the University of Western Australia from 2014 to 2016, and a Postdoctoral Fellow in the Munk School of Global Affairs at the University of Toronto in 2013. He completed his DPhil at Oxford University under a Commonwealth Scholarship and a Fellowship from Canada’s Social Sciences and Humanities Research Council. Sean also holds a JD from the University of Ottawa, an MA from the University of British Columbia, and a BA (Hon.) from Queen’s University. In addition to academic achievement, he has worked in the Policy Section of Legal Aid Ontario, and articled with a leading Canadian labour law firm. Sean was admitted to the Law Society of Ontario as a Barrister and Solicitor in 2009. Sean’s research examines the relationship between international law and international politics, with a focus on the use of military force, international organizations, international criminal law, and Canadian foreign policy. Sean’s doctorate examined the role of international law in Canada and Britain’s participation in the Korean War and Afghanistan Conflict. It will be published as a revised monograph by the University of Toronto Press. Sean has three new collaborative international research projects that build on his doctoral work. The first project investigates the influence of international law in Australia’s involvement in the Afghanistan and Iraq conflicts. The second initiative analyzes whether the recent negotiations on the crime of aggression indicate that authority for international peace is shifting from states and the UN Security Council to the International Criminal Court. The third project examines the politics of international criminal law more broadly. Sean welcomes supervision inquiries from potential graduate students that relate to the above projects, or his research interests more generally. In addition to advancing scholarly knowledge, Sean has also employed his research in op-ed articles he has published in Canada and Australia; and in live national television interviews and public presentations he has been invited to give. By disseminating his work widely in these ways, Sean seeks to help inform public debate of important policy issues, and improve external scrutiny of internal state decision-making. Sean is available for media interviews and policy commentary related to his areas of expertise, and encourages interested journalists to contact him directly. Influential but Not Binding? International Law in Canada and Britain’s Participation in the Korean War and Afghanistan Conflict (under advanced contract with the University of Toronto Press). “The Politics of International Criminal Law”, Introduction to Special Issue, International Criminal Law Review, co-edited with Holly Cullen and Philipp Kastner, issue 18(6) (Brill, November 2018). “Why is Humanitarian Intervention So Divisive? Revisiting the Debate over the 1999 Kosovo Intervention”, Journal on the Use of Force and International Law, issue 3(2) (Routledge, 2016). “Unbound in War? International Law and Britain’s Participation in the Korean War”, under review at the Leiden Journal of International Law (Cambridge University Press). The Politics of International Criminal Law, with Philipp Kastner and Holly Cullen (Brill, 2019). “The Crime of Aggression: Shifting Authority for International Peace?”, in International Criminal Law in Context, research handbook edited by Philipp Kastner (Routledge, 2017). International Law and Armed Conflict: Exploring the Faultlines – Essays in Honour of Yoram Dinstein, Michael Schmitt and Jelena Pejic, eds. (Martinus Nijhoff Publishers, 2007), in v. 46 of the Canadian Yearbook of International Law (University of British Columbia Press, 2009) at 768-774. Repatriation of Omar Khadr to be Tried under Canadian Law (Report submitted to Senate Standing Committee on Human Rights, January 2008, and Parliamentary Sub-Committee on International Human Rights, March 2008) (with eight students, under the direction of Prof. Craig Forcese) 153 pages.